Thermoelectric materials therefore hold great promise for turning waste heat back into useful power and are touted for use in hybrid cars, new and efficient refrigerators, and other cooling or heating applications. Thermoelectric devices are energy converters - they are based on the fact that when certain materials are heated, they generate a significant electrical voltage; conversely, when a voltage is applied to them, they become hotter on one side, and colder on the other. But they have one big drawback: they are very inefficient. Efficient thermoelectric materials need to be very good at conducting electricity, but not heat - and that's the problem; these materials are not efficient enough to be practical. In most materials, electrical and thermal conductivity go hand in hand. So researchers have to find ways of boosting the performance of thermoelectric materials by separating the two properties. Graphene has attracted a huge amount of attention in recent years with its extraordinarily high electrical and thermal conductivities, mechanical, chemical properties, and large surface area. 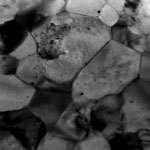 In order to meet the various demands for a variety of applications, preparation of desired structures of graphene sheets with controlled dimension and architecture are of significant importance. While research on flat graphene oxide structures has become quite common, there have been few reports on the preparation of hollow capsules of graphene through the nanosize, controlled assembly of graphene. Researchers in South Korea have now demonstrated the formation of graphene-based capsules through layer-by-layer (LbL) assembly of surface-functionalized reduced graphene oxide nanosheets of opposite charges onto polystyrene colloidal particles to produce multilayer thin films of graphene nanosheets. Researchers worldwide are working on fast and low-cost strategies to sequence DNA, that is, to read off the content of our genome. 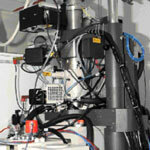 Particularly promising for future genome sequencing are devices that measure single molecules. In this respect, the creation of nanochannels or nanopores in thin membranes has attracted much interest due to the potential to isolate and sense single DNA molecules while they translocate through the highly confined channels. Particularly interesting are techniques that can offer fast and low cost readout of long DNA molecules without the need of DNA labelling or amplification. In very interesting work performed at Imperial College London, researchers have now successfully developed a protocol for the fabrication of a solid state nanopore aligned to a tunneling junction. Projection photolithography is mostly limited to flat surfaces. However, many emerging areas of micro- and nanotechnology applications, be it in optics, imaging, sensors or bioengineering, increasingly require the fabrication of microscopic and nanoscopic patterns on nonplanar surfaces. Contact printing and imprinting methods can cope with certain curved surfaces but appear to be restricted to those having a constant magnitude of curvature and a large radius of curvature relative to the arc length at least in one dimension. 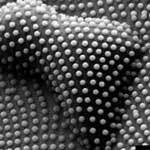 Researchers have now demonstrated that hexagonal noncontiguously packed (HNCP) colloidal crystals trapped at the air-water interface can be directly transferred onto solid substrates to give HNCP and distorted HNCP patterns. 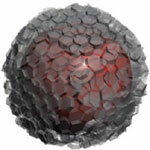 This bottom-up method uses self-assembled nanoparticle arrays and is not limited to flat surfaces at all. 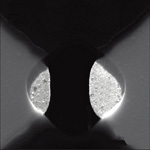 Dip-Pen Nanolithography (DPN) is a scanning probe lithography technique in which the tip of an atomic force microscope (AFM) is used to deliver molecules to a surface, allowing nanostructured surface patterning on scales of under 100 nm. This direct-write technique offers high-resolution patterning capabilities for a number of molecular and biomolecular 'inks' on a variety of substrates, such as metals, semiconductors, and monolayer functionalized surfaces. It's becoming a work-horse tool for the scientist interested in fabricating and studying soft- and hard-matter on the sub-100nm length scale. 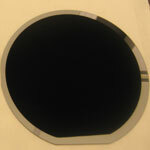 Using DPN for fabricating graphene devices has not been previously shown. 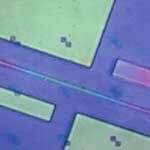 Researchers at Stanford University have now evaluated DPN as an alternative to conventional electron-beam lithography (EBL) for tailoring such devices. The workhorse of current nanofabrication processes, electron beam lithography (EBL), has good resolution but has good resolution, it is difficult to precisely control the pattern size at the sub-20 nm scale due to the proximity effect and the large beam spot. A more recent nanolithographic strategy, the molecular ruler (MR) method, shows great promise it can precisely control the size of the gap at the nanoscale. Although EBL and MR have been combined before in attempting high-resolution nanofabrication in the sub-20nm regime, the results were always less than optimal because the electron beam irradiation damage to the MR influenced the formation of nanogaps. Researchers in Japan have now developed a post-EBL process, which does not damage MR molecular layers, and fabricated nanogap structures at the expected positions with high product yield. Gas sensors often operate by detecting the subtle changes that deposited gas molecules make in the way electricity moves through a surface layer. One advantage that carbon nanotubes offer for gas sensors, compared to metal oxide materials, is their fast response time and the fact that they react with gases at lower temperatures, sometimes even as low as room temperature. In order for CNT-based sensors to be able to compete with state-of-the-art CMOS technology, researchers need to develop a low cost, reliable and large-scale reproducible CNT deposition process on the wafer level. Researchers in the UK have now presented a novel concept of wafer level localized growth of 'spaghetti'-like CNTs on a fully processed CMOS substrate. 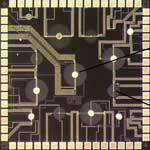 This is the first successful proof of concept for growing CNTs at the post CMOS wafer stage.